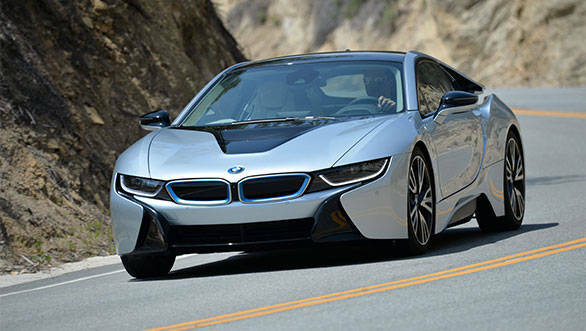 BMW India has launched the i8 hybrid electric supercar at an expectedly steep Rs 2.29 crore ex-showroom, pan-India. The car is built on an eco-friendly platform and gets organic fibres and leather dyes. There is also lots of carbon-fibre in lots of places including the chassis. A twin-scroll turbo 231PS three cylinder 1.5-litre petrol motor powers the BMW i8. There is also the 131PS (96kW) electric motor which drives the front wheels. The electric motor derives power from a lithium-ion battery pack which can be charged from a power socket installed at home. BMW says that this battery pack will last the life of the car. Both the gasoline and electric propulsion systems are connected to each other via BMW's power control electronics. What the power control electronics do is command the electric motor to give you 37km of front-wheel drive range (tested by the EU cycle) and a top speed of 120kmph. Step on the accelerator and the all-wheel drive car goes from 0-100kmph in 4.4 seconds and still returns a fuel efficiency of 48kmpl on the EU driving cycle, with the top speed restricted to 250kmph. The company maintains that in urban driving conditions, a fuel efficiency of 20kmpl is possible.